Event Format: 3-Game Guarantee. Two pool play games; teams then advance to a single-elimination Championship Bracket or Consolation Bracket playoff. Format subject to change based off team numbers, facilities and weather conditions. We have the same cutoff date for all ages but will allow for grade exceptions (see Tournament Rules). NOTE: Coaches are required to provide photocopies of birth certificates for proof of age and current report card for proof of grade (if applicable). This March event provides an excellent opportunity to tune up your team early in the season. Practice is essential at this time of year, but getting the team on the field for live game action allows coaches to realistically evaluate talent while letting the players get the first-game jitters out of the way and work at game speed. The DroughtBuster continues to gain in popularity, averaging over 100 teams the last few years. This event will again be hosted by the cities of Arvada and Boulder. Make sure you're not one of the "Wait List" teams for our first big event of the year! Triple Crown Baseball wants to focus on something positive in the face of increasing talk about negativity in youth sports. 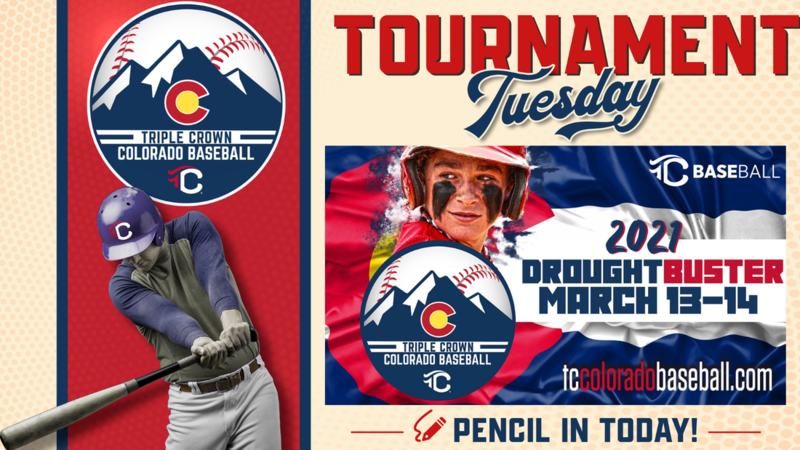 Given the fact that our Colorado Baseball Series involves over 1,800+ teams, the implementation of the award program is massive. We lack the ability to evaluate every game/every player with our own staff. We want the teams to evaluate opposing player behaviors and reward them accordingly. By having coaches award pins to opposing players, we hope to create an ongoing awareness of, focus on, and respect for sportsmanship. ​Parents and Coaches: Please have fun with this and let players know that sportsmanlike behaviors are as commendable as base hits, blazing fastballs and diving stops.